Start with a 3 year old white oak log. Drag to sawmill with back hoe. Saw off the rotten sap wood. Mill a 24 foot 4x8 timber and a few 24 foot 3x6's timber on a 21 foot saw mill. (tricky) 4x8 too heavy. Use 3x6. Carry to house site with backhoe. Plane. Evict some interesting worms. Treat with boric acid. Drill 53 holes in rail. Lag and and bolt to existing timber frame and chimney. Hide anchor bolts and lag bolts with sawed off pegs. (Sorry for the cheat, the rest of house is held together with about 1,000 real wooden pegs.) Drill 53 holes in floor. Install balusters. Wait for wood to season before sanding and polyurethaning. Here are pictures of the finished 3rd floor timber frame hand rail. This first picture was taken from the stairwell, and the eyebrow dormer can be seen to the right. This second picture was taken from the 3rd floor tower. The arched braces in the foreground are curly maple, and the floor in the background is hickory. In the far background is our stucco chimney and a hammer beam truss. I took this third picture to show off the 3/4" pegs in the post. I made the pegs by whittling down some leftover 1" pegs. I thought the 1" pegs were too big in proportion to this 6x6 post. On the list of "critical path items" before we move into our timber frame house is "finish the hand rails." I decided to use mortise and tenon joinery with pegged joints so that the handrails would match the timberframe aesthetic. My witty friend calls this "gothick architecture." I found a 3 year old white oak 6x6 and a 3 year old white oak 3x6 laying outside next to my sawmill. Although the beams were gray and weathered, after a few passes with my beam planer, they looked almost brand new. Natural resistance to decay is one of white oak's wonderful attributes. The first picture shows an interesting ring pattern in this timber. 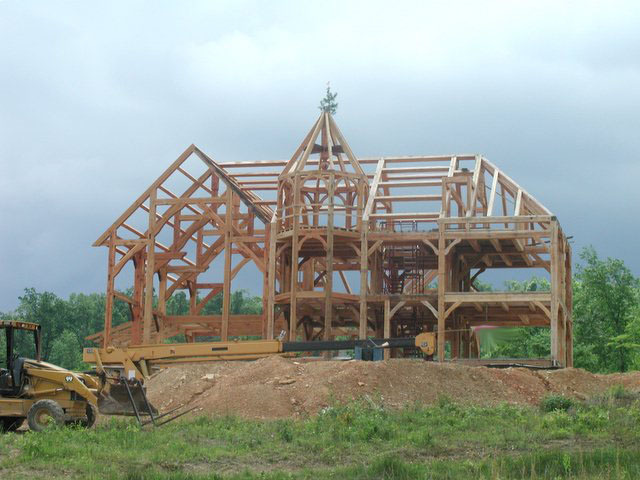 By the way, it's best to use heart-centered timbers like this when timberframing, otherwise the beams are more likely to bow when they dry. Before cutting the joinery, I added a pendant shape to the top of this post. Pendants and other little features like reveals and grooves are often easier to add to posts and beams than the joinery itself. (so why not add them?!) In this instance, I simply set the skill-saw on a 45 degree angle and cut through some lines I had drawn on the timber. I then used a sharp framing chisel to shave off enough thin slivers of wood to hide the scorch marks from the saw. After adding the fru-fru stuff, I moved on to the joinery. Less than 25% of the joints in my house frame are "housed," but I'll readily admit that a housed joint looks best. In addition to adding strength to most joints, a proper housing obscures any gaps that might otherwise show over time where one shrinking timber meets another. Because the hand rail will receive a lot of close-up scrutiny, I took the extra time to implement housed joints here. After drawing my layout lines, I used my Makita chain mortiser to rough out the 4 1/2" deep tenon. I then cut a shallow line around the housing with the skill saw and used a chisel to notch it out. A housed joint does not require any extra work on the tenon, but it is important to carefully test fit the mortise and tenon together and make sure that the tenon does indeed seat all the way into the housing and mortise. While my joint was temporarily together, I drew a pencil line on the hand rail, so that when I disassembled the two pices of wood, I could tell how far the tenon had gone into the mortise. Some adjustment was necessary, so I repeated this process of "test assemble-scribe-disassemble-chisel" a couple of times. After I finished the two handrails and the corner post in the basement, I carried them up 43 stairs to the 3rd floor. Whew, light weight is not among white oak's wonderful attributes. Cutting a mortise into the 26 foot poplar post in the middle of our timberframe was a more sober task. Messing up was not an option! And although poplar is a lot easier to chisel than white oak, I was not able to use my chain mortiser to speed up the process. Instead, I used an auger and a drill to hog out most of the mortise, and then squared the corners with my framing chisel. I also carefully cut a square hole in the finished hickory floor to receive the bottom of the post. In part II of this posting, I'll show the completed handrail, finished with polyurethane, with black iron balusters installed.